Desitin Rapid Relief Cream is a zinc oxide diaper rash cream for control, comfort and relief from irritated skin and diaper rash. The 16 ounce jar provides easy access to the cream when changing diapers, briefs and protective underwear. It instantly forms a protective layer on skin to sooth and relive rash discomfort, providing relief from the first use. The cream is easy to apply in a thin layer to provide comfort and added protection. Zinc Oxide helps further promote protection and healing of dry, chapped, and irritated skin. It is fragrance-free, hypoallergenic, and dermatologist-tested. It goes on smoothly and wipes off easily. Desitin Rapid Relief Cream is your everyday partner in protecting and treating diaper rash. 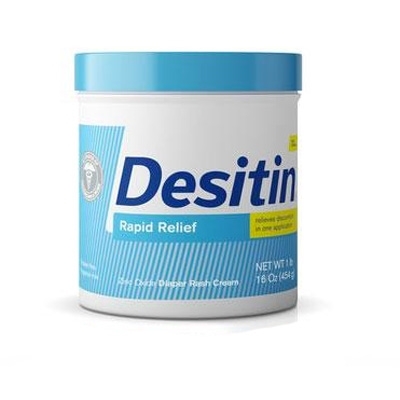 DESITIN® Rapid Relief Cream helps provide overnight relief of diaper rash. In a clinical study, 90% of babies with diaper rash had noticeable relief within 12 hours of the use of DESITIN® Rapid Relief Cream. DESITIN® Rapid Relief Cream is hypoallergenic and pediatrician tested.